Refunding a buyer’s payment is easy if you follow the steps below. 1. Logged in to your NetPay account. 2. Go to “Daily Sales” or “Monthly Sales” under Business. 3. You can select your search preference according to the Date/Month, Merchant Reference ID, Buyer Email or Payment Method. Click “Search” once you have choose your preference. 4. The payment transaction report will appear as below. 5. Under the Action column, you select which of the transaction you wish to refund the buyer and click on “Refund”. 6. For the Refund Type, you can choose either “Full” Or “Partial”. This is subjected to NetPay’s approval. Select the reason for the refund being made. 7. 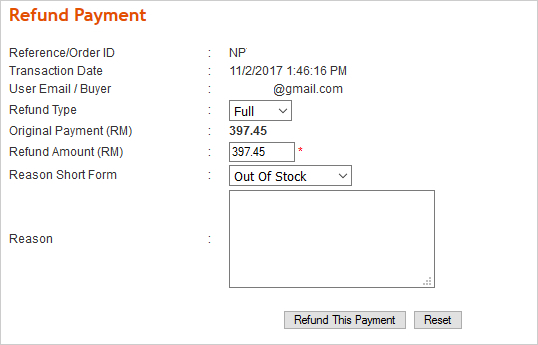 Click on “Refund This Payment”. You are not allowed to refund after settlement cut-off date. The processing time will be 10-14 working days. Update your buyer you have request for the refund. This applies to only payment made through NetPay (Credit card and Internet Banking).